You saw one of these in 'Saving Private Ryan' if you caught that World War II Tom Hanks flick. 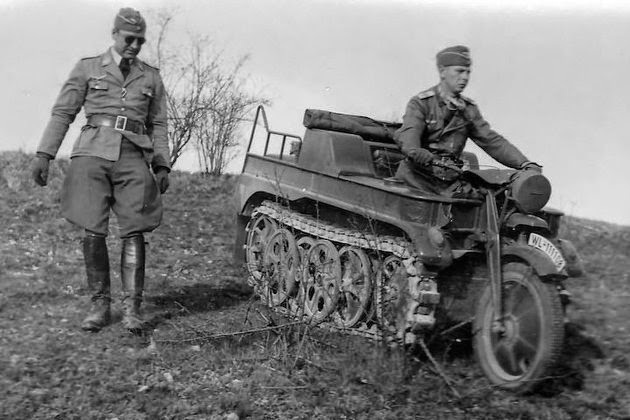 One of the handiest vehicles of the war, on a par with the American jeep, and not nearly as clumsy or over-engineered as you might think on first glance. In fact, in Russia, where a Jeep would have bogged down all the time in muddy and dusty roads leading to nowhere, the HK 101 got the job done handily. 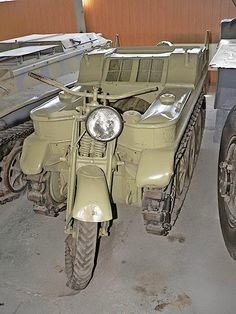 The SdKfz 2 aka The Kettenkrad Motorcycle Tank aka “Kleines Kettenkraftrad HK 101." 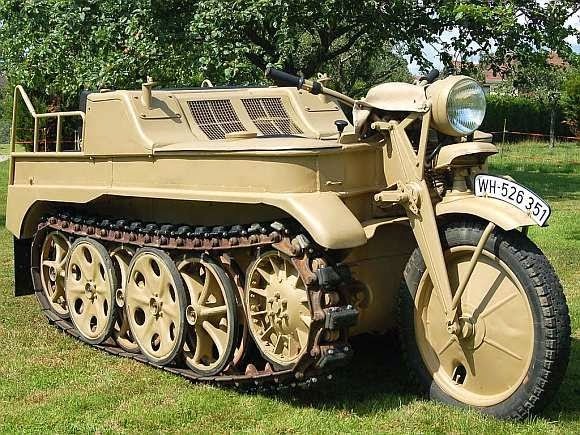 The HK 101 aka SdKfz 2 aka The Kettenkrad Motorcycle Tank aka “Kleines Kettenkraftrad HK 101" is one of the most distinctive vehicles ever to see military action. Designed and patented in 1939 for use by forestry workers, it was adapted for military purposes when the Germans invaded the Soviet Union in 1941. Powered by an Opel four-cylinder 36 hp engine, it had a top speed of 44 mph (more specifically, the engines were manufactured by NSU Motorenwerke AG, which was acquired by the Volkswagen Group in 1969 and then merged with Auto Union, to eventually evolve into Audi as it is known today). The operator steered the vehicle by turning the handlebars; for sharp turns the track brakes would kick in. These little buggers could go an astounding 44 mph/60 km/hour. 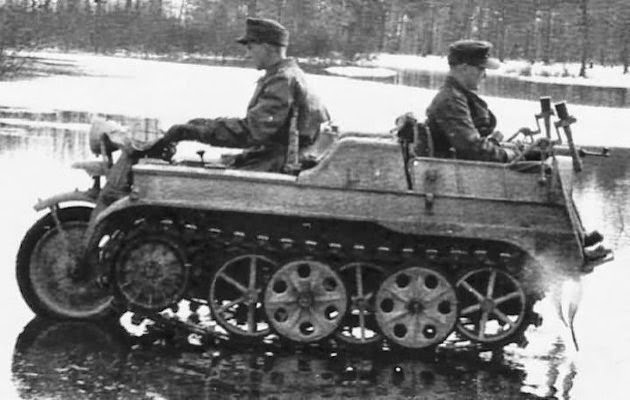 The Wehrmacht used the HK 101 as a general-purpose utility vehicle, employing it to lay wires, transport soldiers, and tow aircraft. The vehicle came with a separate cargo trailer, enabling it to haul large loads. 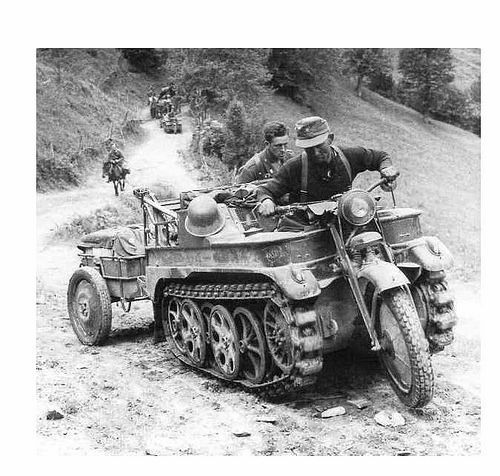 In muddy terrain it was common to remove the front wheel altogether and rely entirely on the tracks for transport. German factories turned out 8,345 units during the course of the conflict. In 1944, the Allies bombed the factory where it was built, which brought an end to war-time production. However, there already were so many, and Germany had so little gasoline left to run vehicles, that it probably didn't make any difference anyway. 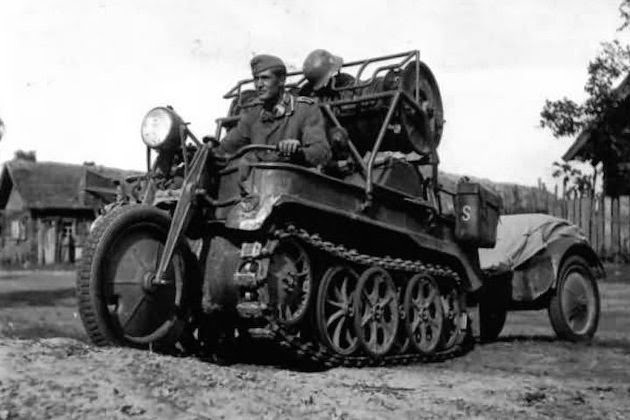 Besides, the entire purpose of the vehicle was to gain mobility in the wilderness of Russia, and the Wehrmacht by then had lost most of that territory anyway. 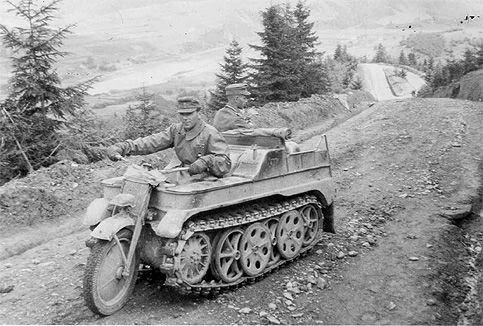 The HK 101 was of much less use in Western Europe, where roads were plentiful and the need for a tracked vehicle much less. Germany’s defeat of course led to its governance by Allied officials, who forbade German industry from building military vehicles. As the HK 101 had originally been developed for agricultural purposes, though, it gained a very rare exemption from this rule. As a result, renewed production went on until sometime in 1948 or 1949, during which time between 500 and 600 were manufactured. 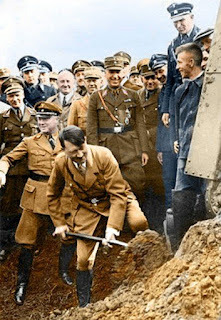 More importantly, that gave some Germans very good jobs in the wrecked economy. There are rumors that these continued to be manufactured much later in the Soviet bloc countries. Many remain in existence, and here and there one or more may still be in use. If you are lucky, you might find an unrestored one in a barn and buy it for a song. Properly restored, they are quite valuable. The sheer volume of units built during the war and afterward make the HK 101 a common sight among hobbyists and history buffs in Europe (such as at the annual exotic vehicle gathering north of Berlin). You can occasionally see one for sale in the trade magazines. There also are many sitting in the holds of sunken cargo vessels all around Europe, such as in the coastal waters of Norway (one was recovered in Narvik in the '80s that could be driven through the city streets). 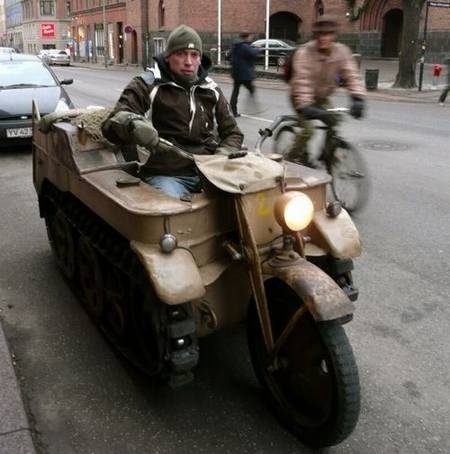 Many have been restored to their full wartime glory (minus munitions), and the modern German government allows owners to drive them on public streets. Some of these vehicles have even been modified by farmers for use as tractors. The HK 101’s unique design and unconventional profile make it one of the more interesting examples from military history.